HUGE Scandinavian Block going to bring mondo snow and cold to Siberia !! amugs wrote: HUGE Scandinavian Block going to bring mondo snow and cold to Siberia !! Dis is good! 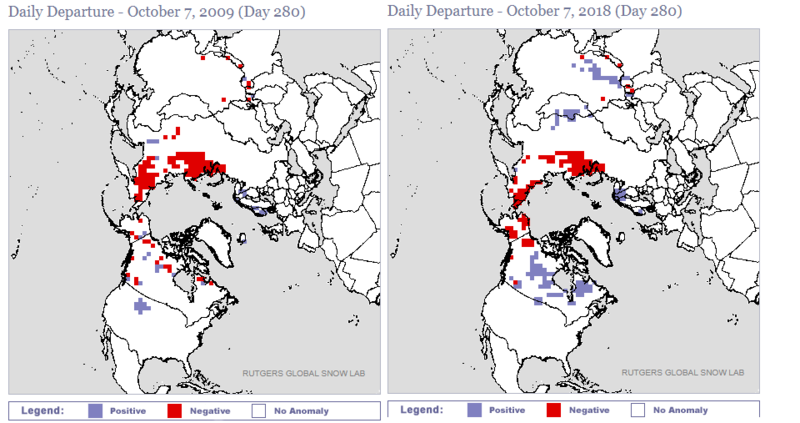 Quick update on the current Siberian snow cover anomalies...2018 is on the right 2009 on the left. Hmmm 2009 by this point in Oct. Looks pretty darn similar. And 2009 just so happened to be a mod el nino year and 2009 also saw CPK with alomst 52" of snow that year. It aint how ya start..its how ya finish. The GEFS are showing some big boy and girl cold in the 3rd week of October. Some of the latest long range models now have a weak/moderate basin wide Nino developing later this fall into the winter. Does anyone have a case study on snowfall amounts during those winters? 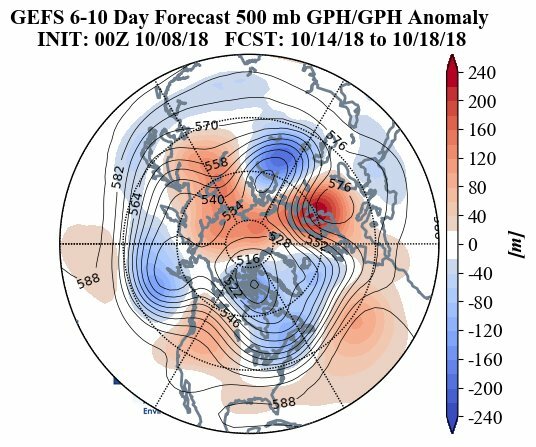 nutleyblizzard wrote: Some of the latest long range models now have a weak/moderate basin wide Nino developing later this fall into the winter. Does anyone have a case study on snowfall amounts during those winters? Here is the link to the Monthly and annual snowfall for CPK and the image of the SSTA for every Moderate El Nino between Dec1st - March 1st going back to the 1960's. Of all these years listed 1994/1995 was the only one with well below normal snowfall for CPK at 11.8" for the season(eww). The 94/95 season was preceded by a strong El Nino in 91/92; then a weak El Nino in 93/94. 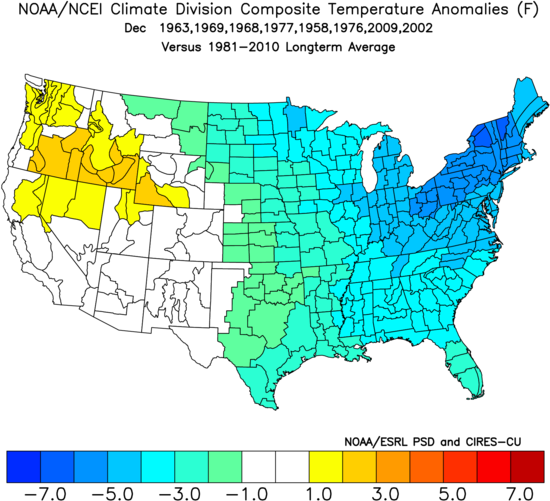 It was also the only moderate El Nino listed above that was preceded by an El Nino conditions the prev winter. Every other year listed was preceded by either weak La Nina conditions, or cold neutral conditions which is exactly what this winter season is preceded by. 86/87 had avg to slightly below avg(23.1"), while 68/69 had slight above avg snowfall(30.2"). 63/64, 02/03, and 09/10 all had well above snowfall. When or if I have time I will try and do the same analysis for the weak El Nino seasons. 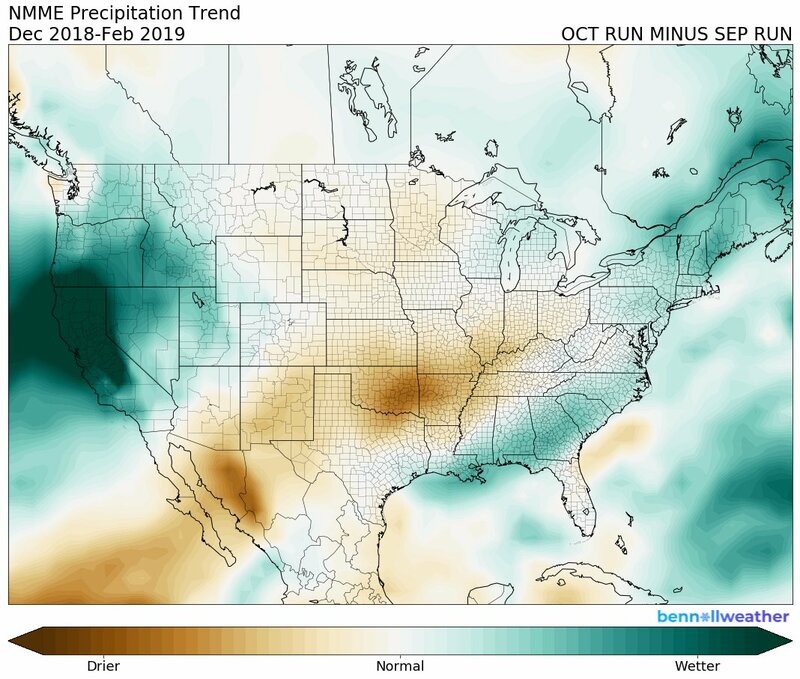 Ben Noll release the October winter forecast of the NMME and guess which direction it went - warm (notoriously for this) or cold?? Would love this to verify!!!!! This may bring CP out of hibernation. dkodgis wrote: This may bring CP out of hibernation. 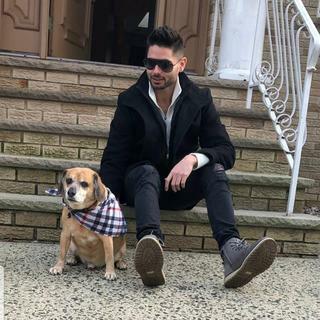 LOL, between this terrible warm, humid cloudy summer and his beloved Yankees losing, don't think we will hear from CP until the first flakes fall. The change to much cooler weather up here, temps at night getting into the 30's, will finally make it feel like Fall.Some of the long range maps are looking good. Here's a look at SSTA's for the month of September. 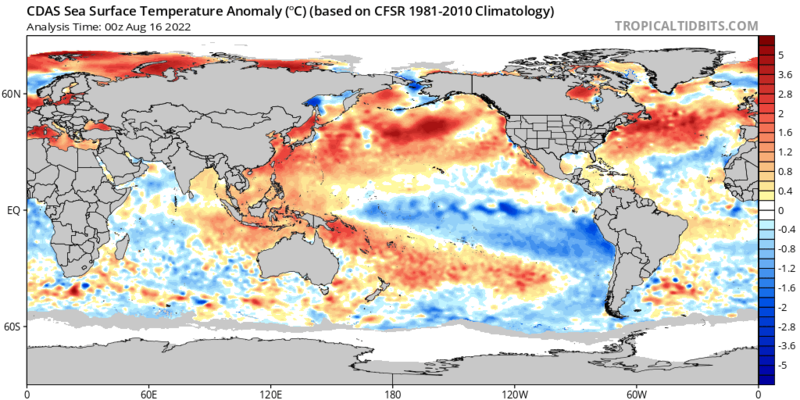 ENSO region 1+2 appeared to have warmed up substantially. The ONI values were negative for much of August and September but as of the last update for Week 01 of October it is up to +0.7. There is a lot of volatility with SSTA's in this region because its depth is shallow compared to the other regions. I would not put a whole lot stock into the warm-up here just yet. Last 7 days we're still seeing continued warmth over 1+2 and cooling over 3.4 and 4 regions. We'll see how this plays out in the month of October with the MJO currently in phase 2-3 heading into the COD. Check out that warm pool in the GOA. Thats quite something. More -EPO/+PNA and less -NAO? Thats been the theme for the last 5 winters now. Latest UKMET seasonal winter outlook is out and its a winter lovers dream. Cold east of the Rockies with an active sub tropical jet along the east coast. 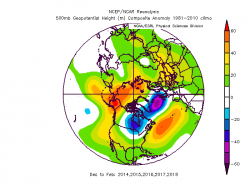 Its a -EPO pattern with a -NAO and -AO developing as the winter moves along. nutleyblizzard wrote: Latest UKMET seasonal winter outlook is out and its a winter lovers dream. Cold east of the Rockies with an active sub tropical jet along the east coast. Its a -EPO pattern with a -NAO and -AO developing as the winter moves along. 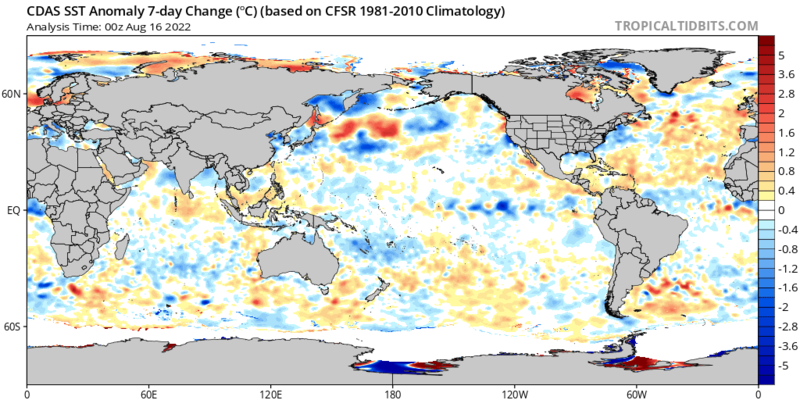 Look at the warm blob in the GOA giving is a POS PDO ala13-14 and more so 14-15 winter. That is a big factor for us, I'll take the EPO, PA and AO triplet and run. If we can get the NAO to help with either a Karnes Sea Block or Scandanavian Block will be very very happy around here. Low Solar is going to help out IMO with High Latitude blocking. Something g to note as well the Siberia snow pa kis going to build greatly as is the Canadian glacier along with Greenland. The cold is ready to invade and the mechanisms are there just give it sometime. October 7th, 2002: The temperature in NYC was in the mid-70s. Then next day, it began a stretch of 189 consecutive days without a high temperature at or above 70 degrees, which over the past couple of decades is the longest such stretch. Not until April 15th, 2003 did it hit 70 again. 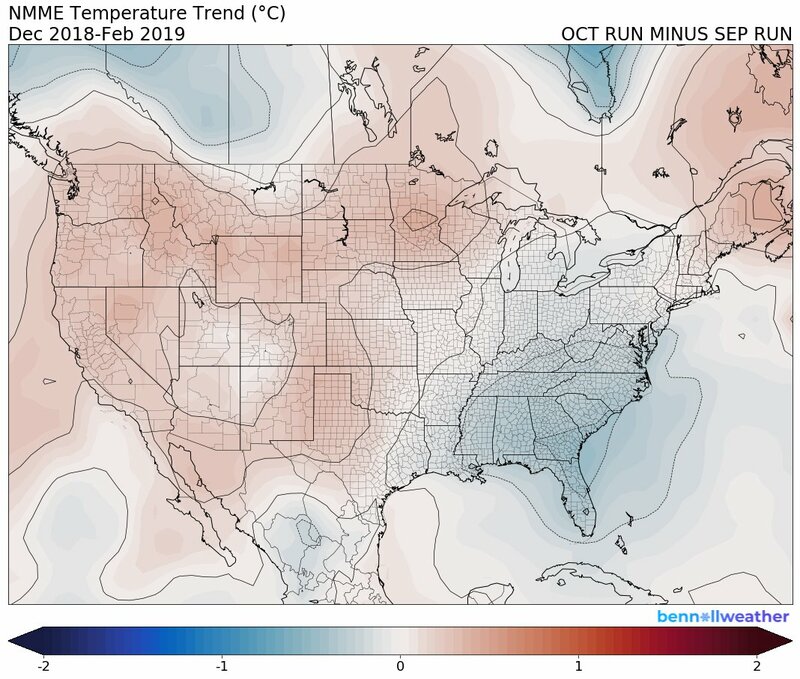 In fact, from October 8th-31st, the highest temperature in NYC was 64 degrees. big pattern change starting today and lasting through the end of the month. say goodbye to summer and the WAR. +pna, -epo and ao along with a very active sub tropical jet. trough will remain in east for rest of October and will actually strengthen as we head towards end of month. 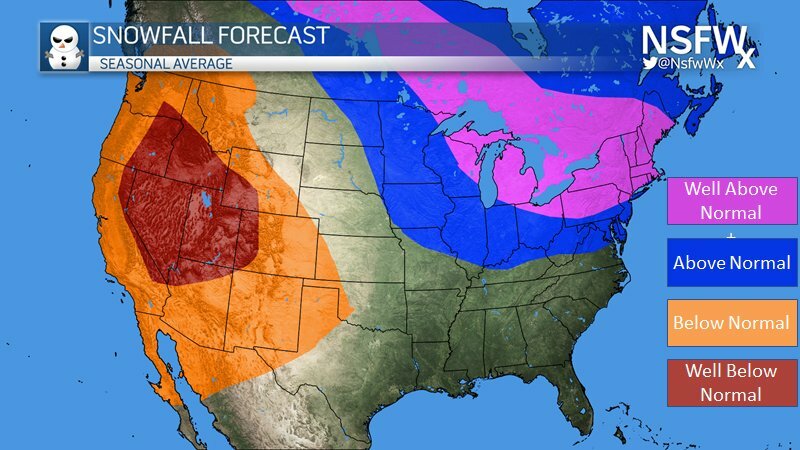 if this pattern sets up at some point in winter it could be epic. mike we probably will not see 70* the rest of this month. the pna ridge on all ensemble guidance in the 8+ day range is beautiful (gets stronger as we go out in time which is unusual for ensembles). centered in western Canada and extends from northern Rockies into arctic circle. also to note the trough off the southern cal and Mexican west coast (sub tropical jet). any interactions with this jet and northern stream timed right an I can envision snow for late October for at least parts of our area. let the fun begin. algae888 wrote: big pattern change starting today and lasting through the end of the month. say goodbye to summer and the WAR. +pna, -epo and ao along with a very active sub tropical jet. trough will remain in east for rest of October and will actually strengthen as we head towards end of month. if this pattern sets up at some point in winter it could be epic. mike we probably will not see 70* the rest of this month. Jamstec seasonal outlook has a moderate strength central-east based Nino for the upcoming winter. From what I can tell off the small maps, temps look to be near normal or slightly above with above normal precip.